I decided to write about this, to help anyone who may be worried about postpartum clots or bleeding and unsure what to do, as I know I definitely was and I had no idea something like this could even happen. 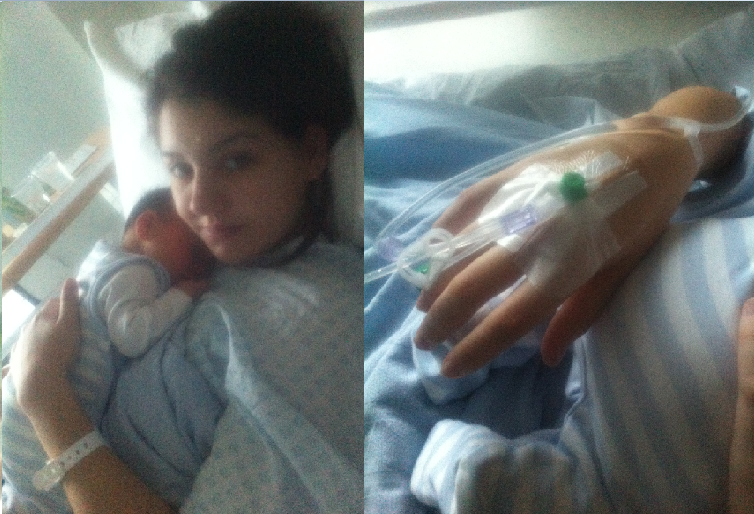 So it was six days since I gave birth to Noah and I went to the toilet that Saturday morning. I felt something slightly hanging out (yes, tmi, but be prepared this is FULL of them) although I’d not really had any until now, I assumed it was a clot and I’d pass it so I left it, I was in no pain so it didn’t bother me. That night around 10pm I went to the toilet and it was further out now, so after some difficult manoeuvring with a mirror, I decided to try and pull it out, it didn’t hurt in the slightest but it did take quite a bit of pulling. My first thoughts when I managed to get this huge 15cm long ‘thing? !’ out, was ‘Oh my god, is that part of the cord?’. I was alarmed so I called John into the bathroom, who was equally as worried, especially as my now previous pinky-brown bleeding, was very, very heavy and bright red. We decided to call my Mum down who advised me it was probably just a clot and to wait until the morning, if I was still bleeding, we’d call the midwives. However, after a couple of hours of very heavy bleeding, I decided to call them and they advised me to make my way in. I was pretty upset to be leaving Noah & John, I decided it best rather than drag him out in the freezing cold at 12am. My mum drove me to the hospital and the midwife examined me, she took a look at the clot which I did bring in, in a sandwich bag (had to be done) and told us how she thought it was membranes. Then the doctor came after being in surgery, she immediately knew it was retained placenta. She then tried to see if she could get more out with a few medical instruments, she did get some more straggly bits out but as she discovered that the neck of my womb was still very much open, it indicated there was much more left behind. I was given a bed (granted, in my own room again with my own bathroom) on the labour ward and told the consultant would see me in the morning for a scan to see if there was any more left behind, if there was, I would need a dilation and curettage (D&C) which is basically, vacuuming your womb. Morning came and so did quite a rude consultant, she seemed far more bothered about the way my notes were not filed correctly, than the fact I was going through this because their midwives had failed to check over my placenta correctly. She explained how she was going to go ahead with surgery and not bother with the scan as it was very likely there was retained placenta. A couple of hours later I was sat on the side of the theatre table, waiting for the anaesthetist to give me an epidural, something which I was very upset about having. I’d managed to push out a 9lb 13oz baby without one, I really didn’t want one now. But I had no choice. I was given one, which in fairness really wasn’t bad at all. Then the procedure began, I couldn’t feel anything, but could see my tummy moving up and down where the vacuum was underneath. It was all over within around 20 minutes, and I was wheeled back to my room to wait for around 6 hours till the epidural had worn off. As soon as it has, I pestered at the midwives to give my medication and final checks so I could get home to my baby. All in all I felt pretty traumatised. I was 12 days overdue with Noah, your placenta does start to go bad and break up, the midwife should have examined it properly to see it wasn’t all there when I pushed it out. The D&C procedure can have such lasting and damaging effects, the vacuum can tear a hole in your womb and leave you completely unable to have children. I probably won’t know the full effects that has had, until I do come to have children again or become pregnant. I felt extremely vulnerable and that the hospital really didn’t explain anything to me before it happened, it did all happen so quickly. Luckily, because I had a 3rd degree tear giving birth to Noah, I’d been on antibiotics, had I not been, I would of developed a womb infection from the left over placenta rotting away inside of me. I do hope this helps anyone who goes through the same, as I tried to research desperately that morning in hospital, but found nothing on it.